Just a quick write-up for this week. When we last left our heroes, they were watching three giant "barnacles" on the ceiling of a ruined, alien temple dilate open and start to release something into the room. The "barnacles" released their contents - three floating horrors, like beaked brains trailing jellyfish tendrils, into the room. 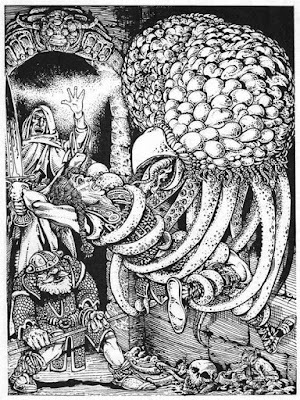 These were soon identified by the party as Grell - extradimensional monsters driven by an uncontrollable hunger. 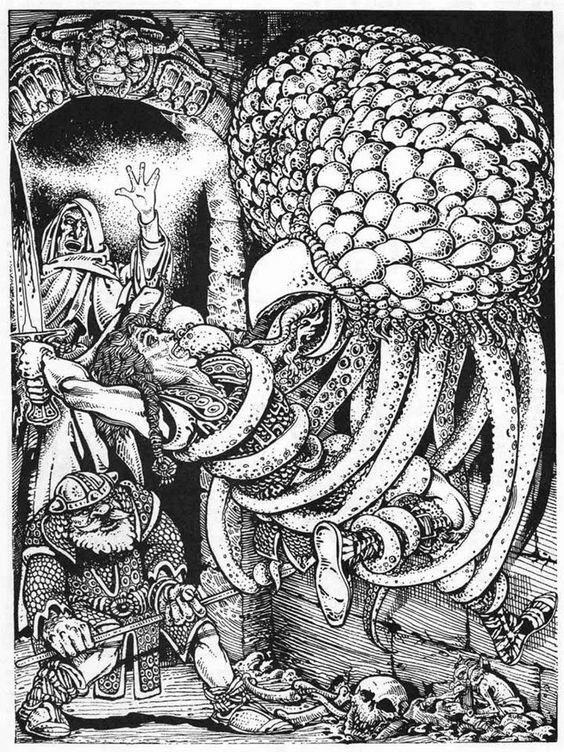 Having eaten the brains of the cultists that had accidentally summoned them, the Grell had encysted themselves on the ceiling to await fresh food - i.e., the PCs. Kholark launched himself on top of the nearest Grell, while Lakka and Mivahl were quickly paralyzed by stinging tentacles. Shrugging off the paralysis, Mivahl delivered a Shocking Grasp to the Grell that had attacked him, only to learn that these creatures were immune to electrical damage. 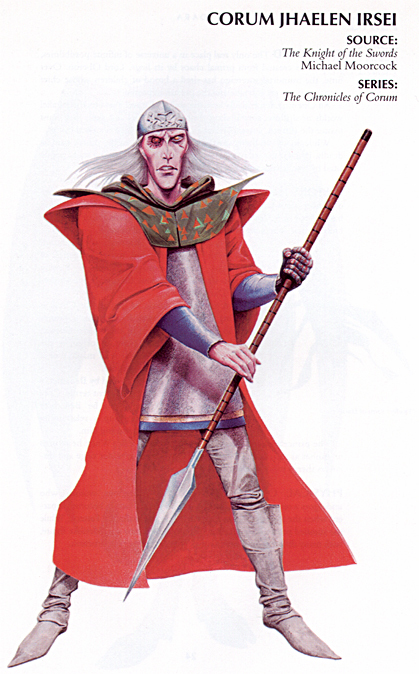 Regardless, the party soon made short work of the creatures, varnishing the floor of the temple with their blue-gray ichor. Searching the rest of the temple, they soon figured out that it was dedicated to a minor avatar of Yog-Sothoth, the Key and the Gate, Alpha and Omega, The Guardian of All that Is, Was and Will Be Again. This piqued Dormammu's interest, given that he derives his warlock powers from pacts made with the Great Old Ones, and renewed his desire to see what was in the sealed box they'd found. What someone with the Eye might look like. Breaking the seal, they found a roughly spherical, cut into facets resembling an insect's eye. The sphere, in the light, scintillated in all the colors of the normal visual spectrum and three other colors that the party had never seen before nor had names for. Mivahl recognized it as the Eye of Rhynn - an ancient and powerful artifact, literally an eye torn from the face of a Lesser Outer God vigintillions of years ago and cast into the multiverse, forever to be sought and fought over by wizards, said to bring power to any willing to tear out their own left eye and replace it with the Eye. No sooner had Mivahl explained the provenance of the Eye, then Dormammu was thrusting the Eye and a dagger into Sylvus' hands, urging him to cut out Dormammu's left eye. With his original eye removed and the Eye inserted, Dormammu got the unsettling experience of feeling the Eye rerouting blood vessels and nerve endings to nourish and support itself. He soon realized he needed an eyepatch - he could only see out of one eye or the other at a time without experiencing overwhelming vertigo and disorientation, as the Eye does not see the in the same spectrum he's used to, instead presenting his brain with a thermal image of what's in front of him. As his body attuned to the Eye, he got a sense of what it could do - X-ray vision for a cumulative two minutes per day with concentration, the ability to determine if someone is acting under magical compulsion, resistance to psychic attacks, and most excitingly, an ability to, once per week, fire an optic blast that mimicked a Cone of Cold spell. On the down-side, that half of Dormammu's face is now a spiderweb of varicose veins radiating out from the eye-socket. The rest of the party's journey to the Groaning Keep passed uneventfully, and after burning away some Assassin Vines, entered without difficulty. The party spread out, investigating the castle courtyard, where the remains of the skeletons they had defeated on their last visit still lay moldering on the ashen soil. Lakka and Jaeger entered one of the side-buildings lining the north wall of the courtyard, and soon stumbled directly into one of the undead knights of the Groaning Keep. The knight swung its rusting longsword at Jaeger and then grabbed his face with a bony claw, its necrotic grip burning a handprint into Jaeger's skin. Grumble ... that's what I get for not sending "Lasair's point of view" notes. :-) Lasair figured out what the eye was (knowledge gained from rooting through the refuse bins of wizards), and then Mivahl was able to add more detail. One thing missing ... before putting the eye in Dormammu, the party discovered that there was a socket for the eye in the idle/statue. The eye was first put into the statue, to see what would happen. There was something like an earthquake, and the eye sparked with even more light. Since nothing further happened, we took the eye back out. Dormammu persuaded us to replace this eye with the artifact. Lasair thought it a bad idea ... but at the same time, was morbidly curios to see what would happen.